(April 11, 2019) — The recent decision by the Hague-based International Court of Justice that the Chagos Islands—with its huge US military base at Diego Garcia—are being illegally occupied by the United Kingdom (UK) has the potential to upend the strategic plans of a dozen regional capitals, ranging from Beijing to Riyadh. Its strategic location between Africa and Indonesia and 1,000 miles south of India, gives the US access to the Middle East, Central and South Asia and the vast Indian Ocean. No oil tanker, no warship, no aircraft can move without its knowledge. Most Americans have never heard of Diego Garcia—for a good reason: no journalist has been allowed there for more than 30 years and the Pentagon keeps the base wrapped in a cocoon of national security. Indeed, the UK leased the base to the Americans in 1966 without informing either the British Parliament or the US Congress. The suit was brought by Mauritius and some of the 1,500 Chagos islanders, who were forcibly removed from the archipelago in 1973. The Americans, calling it “sanitizing” the islands, moved the Chogossians more than 1,000 miles to Mauritius and the Seychelles, where they have languished in poverty ever since. The Indian Ocean has become a major theater of competition between India, the US, and Japan on one side, and the growing presence of China on the other. Tensions have flared between India and China over the Maldives and Sri Lanka, specifically China’s efforts to use ports on those island nations. India recently joined with Japan and the US in a war game—Malabar 18—that modeled shutting down the strategic Malacca Straits between Sumatra and Malaysia, through which some 80 percent of China’s energy supplies pass each year. India, which has its own issues with China dating back to their 1962 border war, is ramping up its anti-submarine forces and building up its deep-water navy. New Delhi also recently added a long-range Agni-V missile that is designed to strike deep into China, and the rightwing government of Narendra Modi is increasingly chummy with the American military. The Americans even changed their regional military organization from “Pacific Command” to “Indo-Pacific Command,” in deference to New Delhi. 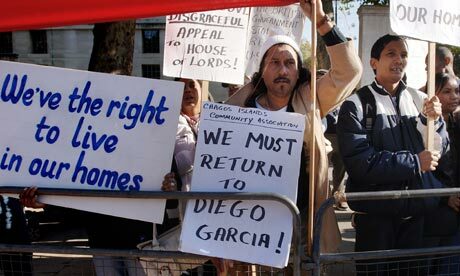 The fight to de-colonize the Chagos Islands will now move to the UN General Assembly. In the end, Britain may ignore the General Assembly and the Court, but it will be hard-pressed to make a credible case for doing so. How Great Britain can argue for international law in the Crimea and South China Sea, while ignoring the International Court of Justice on the Chagos, will require some fancy footwork. In the meantime, Mauritius Prime Minister Pravard Jugnauth calls the Court decision “historic,” and one that will eventually allow the 6,000 native Chagossians and their descendents “to return home.”. osted in accordance with Title 17, Section 107, US Code, for noncommercial, educational purposes.